Albertville, AL – During National Child Abuse Prevention Month in April, CAJA challenges residents of Marshall County to stand against child abuse and take action to support children who have been abused or neglected. At any given time, there are over 100 children in foster care in Marshall County. These children come into the child welfare system through no fault of their own. Substance abuse, including abuse of methamphetamine, opioids, and prescription pain pills, continue to be a factor in the abuse and neglect cases in our county that cause children to enter foster care. Throughout the month of April, CAJA is calling on members of the community to help our program serve more of Marshall County’s most vulnerable children. Everyone can play a part, either by becoming a volunteer, donating, or educating others about the needs of these children. Without intervention, the odds are stacked against children in foster care. A child with a Court Appointed Juvenile Advocate (CAJA) volunteer, however, spends 20 percent less time in foster care, on average, compared to a child without a CAJA volunteer according to our National CASA Association. Studies show children with a CAJA volunteer receive more services that are critical to their well-being and are four times more likely to find a permanent home. CAJA of Marshall County is a member of the National Court Appointed Special Advocate Association (National CASA), a nationwide network of programs in nearly 1,000 communities. At the heart of the movement are nearly 87,000 highly trained volunteers who advocate for the best interests of more than 280,000 of America’s children who have been abused or neglected. In Marshall County, there are currently 20 volunteer advocates fighting for the best interests of 55 children but there are more children who need the care and support of a CAJA volunteer. 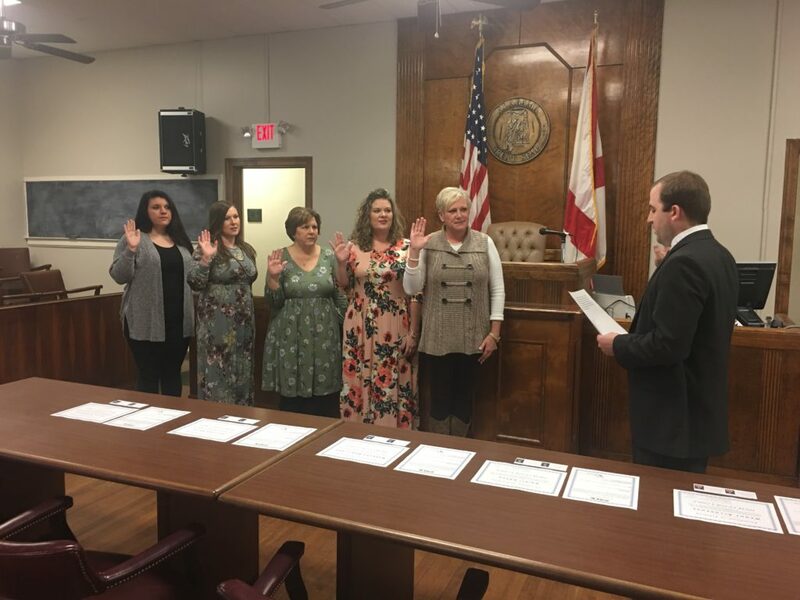 On March 8, 2018, five new volunteer advocates completed the training program and were sworn in as Officers of the Court by Judge Jay Mastin: Wendy Alldredge, a legal assistant from Boaz, Kristi Green, a retired business owner from Albertville, Barbara Robillard, a retired teacher who relocated to Guntersville, Heather Smith, a legal assistant from Guntersville, and Erica Stephens, a substance abuse counselor from Boaz. For more information about CAJA of Marshall County, to become a supporter or to volunteer, visit www.cajaofmarshall.org or call 256.878.1445.